Paired with papers from the Dewey Decimal Petite Paper pack this little mini card is just too cute I think. Be sure to visit the Lawn Fawn blog to see the other Design Team creations using this cute set and leave a comment there for a chance to win one for yourself! An adorable card! That owl is just too cute!!! I still have to ink mine, so maybe today! SO darn cute! Your coloring is perfection. I seem to be getting some bleeding with mine on the Neenah. LOVE the polka dot scarf! Very sweet. The stickles on the scarf is a stroke of genius. Just love your mini card. This set is so cute and love how you colored him down to his papered pieced scarf. Very cute. I love this lil owl so much!!! And your card is fabulous!! The patterned papers are so great and I LOVE how you added polka dots to the scarf - too original! You always know how to make a "Special" card...I just love that you added a touch of bling, it's the perfect touch! Thanks so much for sharing your inspiration with us!!! So stinkin' cute! 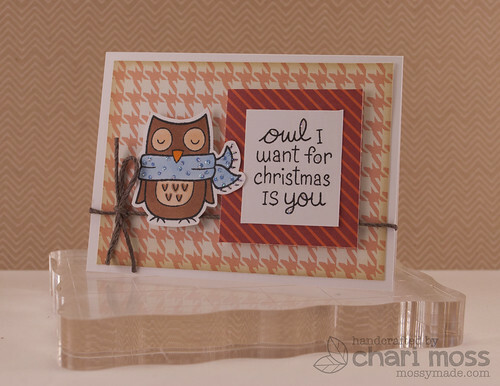 Love that little owl and your crd just highlights his cuteness. What a great color combo. Great job!! Love that you used it with Dewey Decimals instead Christmas papers. So cute. Great job coloring. Blue scarf, it's a 'he.' Wait, I love blue too, it's gotta be a 'her.' Either way, I love your card. Love the way you make all match perfectly. I love the layout, too! Cute cute!